Silent Eruption was formed in 1974 in Britain. In 1975 they won the RCA Soul Search Contest, whilst their first single "Let Me Take You Back in Time" was released in 1976. Finding their success quickly drying out, lead singer Lindel Leslie left the group, and their backing singer Precious Wilson stepped forward to front the band. They went on the road in Germany where Frank Farian, the producer of Boney M., took notice of them. Farian signed the group with the Germany-based Hansa Records and the band supported Boney M. on tour. After a minor hit single with "Party Party", their cover of "I Can't Stand the Rain" from their first album (December 1977) was a hit, reaching #5 in the UK Singles Chart, and #18 in U.S. Billboard Hot 100. It was followed by their second album titled Leave a Light launched towards the end of 1978. The first single of the album "I'll Keep a Light in My Window" was not a big seller. The second single, "One Way Ticket" (a cover of Neil Sedaka's song written by Jack Keller and Hank Hunter), restored them at the top of the charts (a UK #9 hit). Precious Wilson left the group in 1979 to pursue a solo career and was replaced by singer Kim Davis. The group enjoyed their third German Top 10 hit with "Go Johnnie Go" from the third album Fight Fight Fight, although this time, UK success eluded them. Shortly after, tragedy hit when Davis suffered a fatal brain hemorrhage. The band decided to continue and singer Jane Jochen stepped in. A new recording, a cover of Del Shannon's "Runaway" was released in December 1980, and peaked at #21 in the German charts. 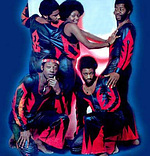 After a compilation album in the spring of 1981 and the single release of "You (You Are My Soul)" from Fight Fight Fight, the band signed to Ralph Siegel's Jupiter Records. By now, without the lead vocals of Precious Wilson, success was drastically diminishing, and their singles from 1981 to 1983, from their fourth album Our Way received little notice. In 1983 Kingsley, their drummer, left the group, and Andi Weekes Barbados joined the band and played the last two years and on the singles "Where Do I Begin" and "Brokeaway". In 1985, the group disbanded. In 1994, Farian released the CD Eruption Gold, which featured seven Eruption titles (all were remixed), with the remaining thirteen tracks all Wilson solo tracks. In 1997, Wilson became the legal owner of the trademark, Eruption. She continues to tour promoting her solo projects, and also as Eruption with her new group, but none of the band's original members perform in the latest line-ups.